All I Want for Christmas is…a Snow Globe? I can’t believe this will be my third Puzzle and Dragons Christmas and every year it gets bigger and better! Gung-Ho has consistently been stepping up their game in terms of the number events, content being released, and magic stone/tamadras/pii give-aways. Tomorrow, we get the revamped Christmas Dungeon with the top difficulty being amusingly named SuperBlessed. I dearly hope the dungeon features festive music (I still do not understand people who play with the sound off) as that helped me get into the Christmas spirit and combined my favourite time of year with my love for PAD. I played last year’s dungeon repeatedly in the vain hope of getting a snowglobe to drop (never got one if I recall), but it collaterally gave the elusive Dub-topalit to evolve those pesky baby Tamadras . I stocked up and kept around 40 as I was playing the mythical weekday dungeons frequently for the boss drops and would always acquire countless as well. Looking at this year’s Dungeon, we have a 1/3 chance at a dropping on floor 3. In addition, adult Pendras, baby Echidnas , and the holiday REM skill up fodder are included. I am going to presume the chance at a snowglobe dropping will be slim to nil and will be a surprising bonus if it does drop. Lastly, the boss can skill up your Heras (with Hera-Is being valuable versus perseverance boss mechanics) and this is the best dungeon to do so due to the other drops. In addition, the Festive Hera provides red teams with a viable gravity and can be used in certain situations. The art and her wink also makes me smile too! In regards to the updated Christmas REM, all the chibi-trash rolls have been removed! In their place, we can now roll a festively dressed healer girl that shares the same skill as Echidna (3-turn delay). In addition, they come in all 5 colours providing a delay to every team composition. There will of course be disappointment with any REM, but at least the consolation prizes this year will be festive and pretty! Lastly, it is worthwhile for a new player to roll this special REM once because you will at worse pull the healer girls and thus having access to Echidna early on. Echidna style delays are amazingly powerful in the early-mid game time frame and having one immediately can help you safely clear more content. For more reading as to why Echidna is strong, click on my detailed guide Here. Christmas Kali will be the most desirable monster this holiday season as she is exactly the same as Dark Kali with only the outfit and colours reversed. With the popularity of rainbow teams (most notably Ra Dragon ) , will always have a permanent sub slot as a full board refresh the board to all 6 elements, being unbindable, 2 time extends , and skill lock resist combines essentially everything you want in a sub. There was some speculation that would be available to purchase from the MP shop for 300k, but instead, Christmas Sonia will be featured. This is good and bad in some ways as many people would have gladly paid the 300k for Christmas Kali, but it would have then forcefully sped up the game meta as everyone would then own a who would otherwise be a rare 6-star godfest exclusive. Ideal teams run two and allowing her Christmas equivalent to be purchasable would be bad in the long run. 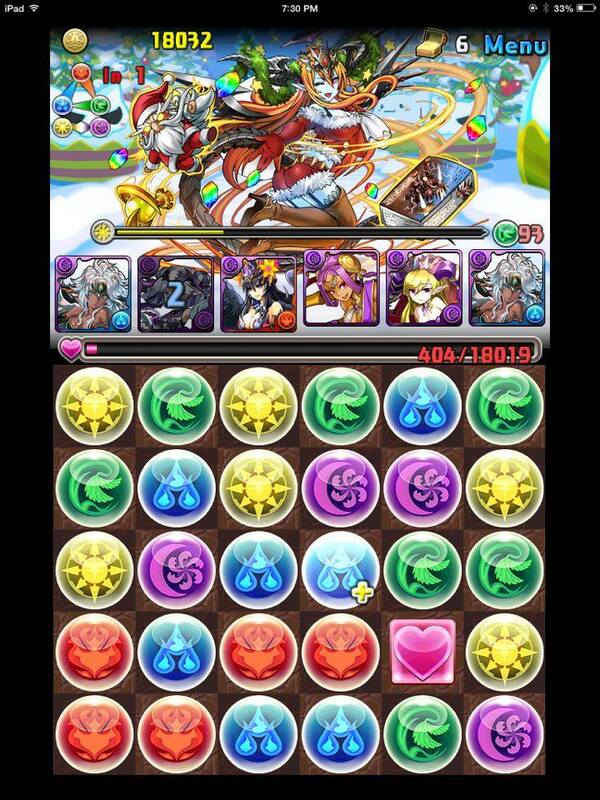 I feel PAD should still have an element of incomplete/non-perfect teams as it forces you to solve the puzzle that is in Puzzle and Dragons. Working towards a goal is what keeps the game exciting and I would hate for that to be taken away. Regardless, is an amazing pull for those who are fortunate enough to be blessed by her presence. Christmas Sonia is the other 8-star featured monster and is also available to be purchased for 300k Monster Points. At 829.7 base stats, is a massive powerhouse, but is not worth the price. Her leader skill boosts dragon and devil type monsters health by 2x and attack by 2.5x. In addition, using an active skill will grant a bonus 1.2x damage for a total of 3x attack multiplier. Unfortunately, red devils are far and few as the best devils are dark typing. A few red dragons / devils I can name off the top of my head include: Cao Cao , Yamato , Awoken Minerva , Awoken Hino , Scarlet , and Chiyome . So there are at least team building options, but the lack of recovery will make the team falter in higher level content. As a sub, she will be competing with Awoken Leilan and Urd , but is missing the skill lock resist awakening which could make team building harder. I want to Christmas Sonia more as I adore the art, but she already feels outdated even prior to release. If you looked up festively cute in the dictionary, you may find a picture of Christmas Haku. However, the fact that her active is the same as her non-awoken evolutions makes me slightly grumpy. Dark teams have the most access to the haste mechanic and stacking several cards allows for frequent access to skills. The board change is still powerful, but I wanted the haste to be tagged along too. In addition, the lack of will hurt team building. On a more positive note, the 5 dark orb enhance awakenings can single-handedly provide 100% plus orb spawn rate along with providing each member on your team a substantial damage boost. As a leader, can reach up to 27x damage for matching red, blue, purple, along with linked 5 orb match with at least one orb being enhanced. This somewhat prevents you abusing two prong attacks or row enhance awakenings, but the passive damage from should somewhat compensate. This play style will feel similar, but much easier to activate than Awoken Yomi . As dark and red are already covered by , you only need to find a blue sub to fill out your roster and allows for a diverse range of team building. will never be a top tier lead or sub in her current state, but she could comfortably clear most of the content available today. Christmas Liu Bei is a recoloured version of the green Liu Bei in a more festive outfit. Looking at the amazing triple awakenings, one would presume he would be a new red superstar. His primary team would be a sub for Awoken Shiva and ‘s active is comparable to Ares as a double orb changer. As heavily discussed in my Awoken Shiva Guide, the double orb change is difficult to properly manage because the board will be overflowed with red and become very difficult to creating 6+ combos and multiple activations. As such, I would not use him on my team and have difficulties placing him on any other viable team as red rows are not quite powerful enough to compete. I guess he can fit on the new Christmas Sonia ‘s team, but it may be difficult to acquire both of them. Not trying to be a grinch about , but he just does not quite fit into the meta at this time. Santa Sakuya received a new ultimate evolution that buffed her base stats, leader skill, and added 2 awakenings. The improved leader skill provides 29x damage for healers when matching red, blue, green, and light orbs. In addition, healer type monsters gain 1.8x to health. This provides a very tanky team as most of the best Sakuya subs are healer and their high recovery will allow for quick healing. As many of you already know, Sakuya is my favourite leader and adore everything about her, but Santa Sakuya just feels lacking when compared to Awoken Sakuya . will feel overshadowed by her Awoken form and will make it difficult to find a consistent group of friends to use often. Santa Sakuya is still a fantastic card and should be more deserving of love and attention, but unless she receives a damage buff to make her comparable (not even including the bind immunity issue), she will just feel like a pretty trophy. Christmas Genie is the only “troll” gold in this holiday REM line up as her active is far too niche to be viable. She is difficult to skill up and the situations in which you need to survive dark attack hits is rare because you should be able to overwhelm the floor with light damage anyway. As such, a difficult to skill up active that only enhances light orbs on an 11 turn cooldown feels pointless. Even with the new awakenings and buffs received, does not have a clear team role she can fill. I like to think all cards have at least some viability, but I am somewhat at a loss as to what to do with . If you can think of any relevant role or team she can play a part of, please let me know as I am currently baffled. Relevancy aside, she does bring a lot of festive cheer and merry good times to your monster box! Christmas Paulina is very powerful (and cute) for a 4-star silver collab REM roll. Her base stats are reasonable if you can afford the 0 recovery and it is her active and awakenings that make her truly shine. Once max skilled, she can be used every 5 turns to produce two water orbs as well as enhancing all water orbs. This allows you to stack her active usage with other orb changers to create an ideal amount of water orbs or to act as a powerful damage enhancement. The 5 water orb enhance awakenings all to single-handedly enhance every water orb that falls down. The 2 skil boost awakenings are just icing on this Christmas delight. The Christmas healer girls of Echidna, Siren, Alraune, Archangel, and Lilith provide the filler 4-star silver pulls from this holiday’s REM, and in all honesty, are very powerful. All 5 share the same active as Echidna and this provides every colour with a 3-turn delay. The delay allows you to safely bypass and entire floor to either kill safely, restall for other actives, or recover your own health. Delays have been somewhat downplayed in the current meta due to the status void ability on the newer bosses, but you can still delay other floors as not everything has a status immunity shield. In addition, the weighted stats are heavily skewed towards recovery along with providing 2 enhanced heart orb awakenings to further boost your healing potential. The single and on-colour row enhance awakening add further value to these adorable girls. Every new account should pull the Christmas REM once (or until you get one of these) as it will give you earlier access to a delay and vastly improving your dungeon clearing capabilities. Considering these are the “worst” rolls you can obtain from this REM adds further value in testing your luck with a pull or 2. Lastly, their artwork is amazing and will add some festive cheer into your monster box. If you do decide to give the Christmas REM a roll or 2, I wish you the best of luck, happy Puzzling, and Merry Christmas! I pulled 3 of the xmas Archangels should I fuse them together for awakenings? Well they sell for 3k monster points and tamadras are relatively easy to come by. If you are hoping for a chance at a skill up, it is still not worthwhile as Echidna can drop all over the place. I would sell the duplicates instead. can i use christmas tree spirit alraune as skill inherit?